Bringing WKU to our community. WKU remains committed to providing access to postsecondary education through our regional campuses in Elizabethtown/Fort Knox, Glasgow and Owensboro. The recent organizational changes, which place these campuses under the direction of the Division of Extended Learning and Outreach (DELO), will allow us to enhance academic offerings with a combination of in-person, online and hybrid delivery formats, and to provide academic programs to meet the unique needs of each community. We firmly believe that education plays a major role in the economic and cultural well-being of a community, and we pledge to remain good community partners. If you have questions, or suggestions, we would love to hear from you. For the eighth consecutive year, WKU has been nationally recognized for its service to military students, veterans and their families. 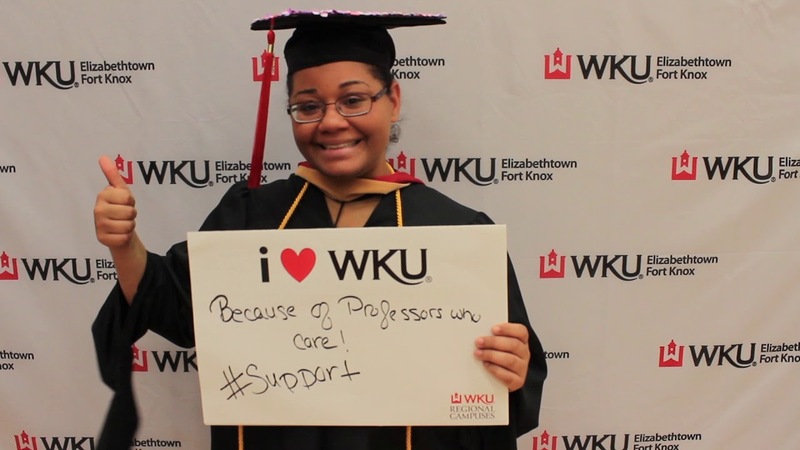 Find out what students love about WKU’s Regional Campuses. Our regional campuses have been the university of choice for thousands of citizens in the region. You can experience the “Spirit of WKU” all on your own by visiting a regional campus near you, sitting in on a class, chatting with students and professors, or talking one-on-one with an academic advisor.